In this exclusive audio interview Emmy Winner Charlotte Robinson host of OUTTAKE VOICES™ talks to Shahid Manning, Founder and Executive Director of Millennia Scope Entertainment Foundation about their upcoming gala for the LGBT entertainment community. 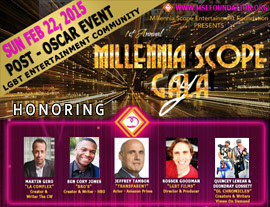 The first annual Millennia Scope Gala is a post Oscar ceremony celebration event honoring the best, brightest and emerging LGBT talent shaping entertainment in Hollywood and takes place on Sunday February 22nd at Los Globos in Los Angeles, California. During this unprecedented fabulous event Millennia Scope will acknowledge the contributions of significant players whose creative work raises awareness and rewrites a modern image of our LGBT community in the world of entertainment and well beyond. Honorees include Martin Gero, Creator “LA Complex” (CW), Ben Cory Jones, Creator and Writer “Bro’s” (HBO), Producer Toni Newman “Heart of A Woman” and Actor Jeffrey Tambor, “Transparent” (Amazon Prime). We talked to Shahid about making the Millennia Scope Gala an annual event and his spin on our LGBT issues. 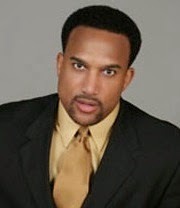 Shahid Manning is a graduate of Howard University’s theatre and business schools. A former corporate executive, Manning moved from New York to Southern California to become an active participant in the theatre and film community in Los Angeles. He has worked in a number of capacities within the entertainment industry uniquely promoting LGBT media and film. In 2009 Manning launched Millennia Scope Entertainment Foundation a 501(c)(3) non-profit organization that supports independent filmmakers of LGBT visual media. Millennia Scope is dedicated to fostering the careers of a community of artists traditionally underserved and underrepresented in mainstream media, who embody diversity, innovation, uniqueness of vision and the next generation of talented filmmakers. Their important fundraising event DIVERSIFYING HOLLYWOOD: 1st Annual Millennia Scope Oscar Gala takes place February 22nd in LA.